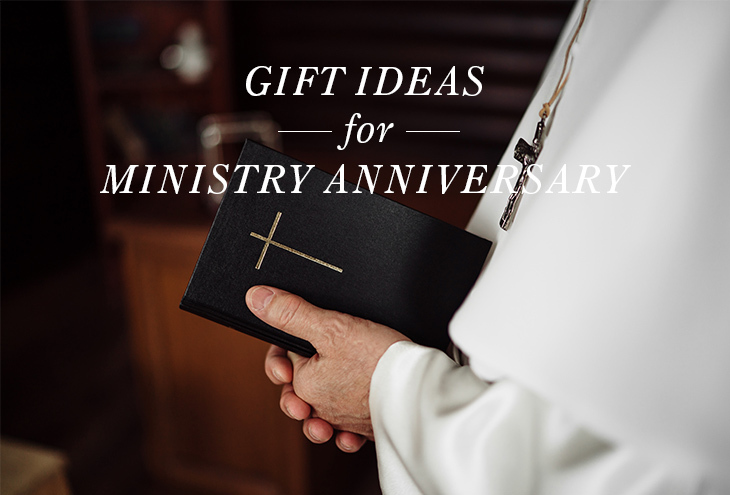 Want to honor a member of the ministry for a special anniversary? It’s important to choose an appropriate gift to mark the occasion. If you follow the suggestions below, you won’t just be giving a present, you’ll be making a memory. 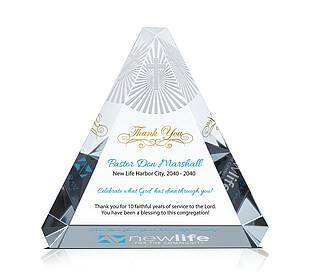 Gifts You Can Engrave: Choosing a token of appreciation with a delicate inscription, whether it is an engraved cross pendant, a stamped leather briefcase or a crystal plaque or monument is an incredibly thoughtful gesture. 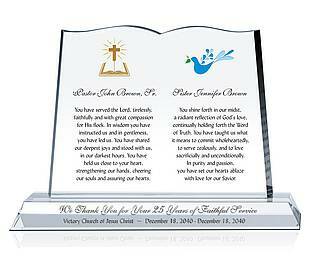 Crystal Central makes pieces especially for Christian occasions including ministry anniversaries. 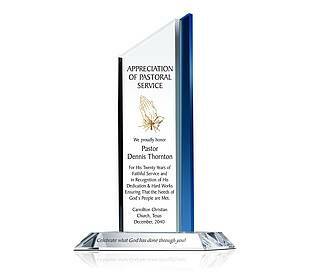 They can all be deep etch engraved at no additional cost. An example is pictured below. Gift Certificates: If you are honoring a pastor’s wedding anniversary with his wife, a gift certificate for a sumptuous dinner for two or a relaxing day at the spa is a beautiful gesture. If your pastor is into wine or a certain sport, get him and his wife a gift certificate to a vineyard or tickets to a game. The sky is the limit and depending on your budget, you have a lot of options. Photo Project: Want to really make a memory? Then gather photos from your pastor’s tenure at your church or pictures highlighting a music minister’s successful projects and make a photo album or memory book. Collages are also an option. If you’d rather choose a single iconic photo blow-up, mat and frame, that’s a beautiful idea. If the arrangement is more casual, have members of the church family write short notes to the honoree that can be incorporated with the photographs.